UD's chapter of the Biomedical Engineering Society traveled to Baltimore for a day of networking with students from Johns Hopkins University and the University of Maryland. 8:54 a.m., April 3, 2015--A contingent of students and faculty from the University of Delaware chapter of the Biomedical Engineering Society (BMES) visited the Johns Hopkins University (JHU) campus in Baltimore on Friday, March 27, to participate in the third annual BMES Undergraduate Research Day. The UD students participated in the event with undergraduates from JHU and the University of Maryland’s Fischell Department of Bioengineering. Designed to showcase the quality of student research projects conducted during the academic year, Research Day also aims to inspire classmates in the biomedical engineering programs to pursue their own research. 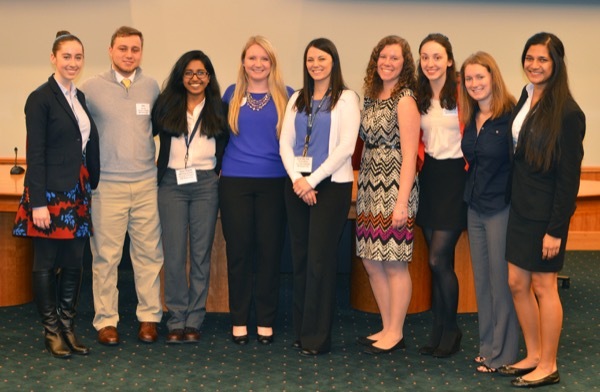 “Joining a professional society is a great way for undergraduate students to begin building the networks and collaborations that are essential to research,” said Emily Day, assistant professor in UD’s biomedical engineering program and faculty adviser for the BMES student chapter. A number of UD students entered abstracts and posters into the competition and Day was among those judging the posters and presentations. Attendees participated in the awards process as well, selecting UD biomedical engineering junior Bretta Fylestra for the Best Poster Award. Fylestra’s poster, titled “A Model to Customize AFO Footplates to Preserve Shank Progression with Limited Ankle Dorsiflexion,” summarized her research with Steven Stanhope, professor in UD’s Department of Kinesiology and Applied Physiology. Her research involves creating a quantitative mathematical model for footplate rollover shapes used in ankle-foot orthoses (AFOs), and she also works with creating customized 3D-printed AFOs to test the mathematical model.